Palestine Today TV reporter Ahmad al-Budeiri and his cameraman were wounded after Israeli soldiers fired stun grenades directly at them. For years now, the government of Israel has pursued increasingly belligerent policies towards Palestinian journalists who cover the Israeli occupation of Palestine and the expansion of the illegal settlements program. This episode is by no means an isolated incident. In May of this year Reporters Without Borders (RWB) issued an article titled the ‘increase in violence by Israeli security forces against Palestinian journalists’. 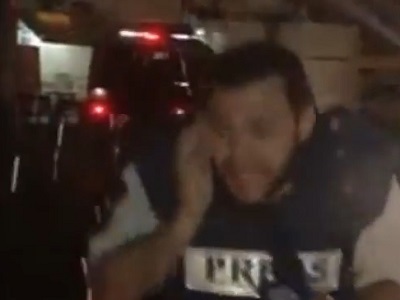 The article documents how the Israeli military intentionally fired rubber bullets and tear gas at Palestinian journalists who were working in the city of Ramallah. 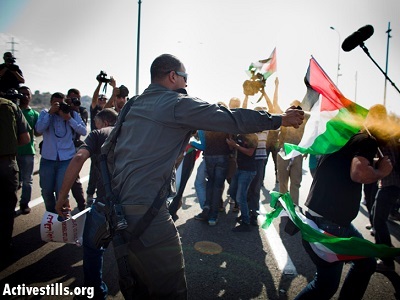 According to the Palestinian Centre for Development and Media Freedoms, Israeli forces have frequently carried out attacks on journalists covering the occupation of Palestine – a trend that is on the rise – with over 30 physical attacks in 2014 alone. – Steven MacMillan contributed this article to PalestineChronicle.com. Visit: The Analyst Report. – Richard Falk report to the UN General Assembly 2008: Report of the Special Rapporteur on the situation of human rights in the Palestinian territories occupied by Israel since 1967. – Section III. Significant human rights challenges: some case studies A. Freedom of expression and harassment of media personnel: the case of Mohammed Omer 18. 19. 20.